“This richly illustrated book explores the contested history of art and nationalism in the tumultuous last decades of British rule in India. Western avant-garde art inspired a powerful weapon of resistance among India’s artists in their struggle against colonial repression, and it is this complex interplay of Western modernism and Indian nationalism that is the core of this book. The Triumph of Modernism takes the surprisingly unremarked Bauhaus exhibition in Calcutta in 1922 as marking the arrival of European modernism in India. 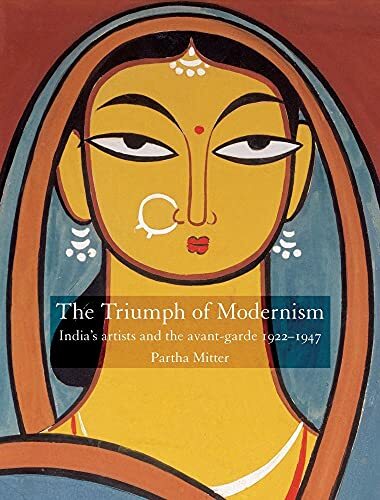 In four broad sections Partha Mitter examines the decline of ‘oriental art’ and the rise of naturalism as well as that of modernism in the 1920s, and the relationship between primitivism and modernism in Indian art: with Mahatma Gandhi inspiring the Indian elite to discover the peasant, the people of the soil became portrayed by artists as ‘noble savages’. A distinct feminine voice also evolved through the rise of female artists. Finally, the author probes the ambivalent relationship between Indian nationalism and imperial patronage of the arts.